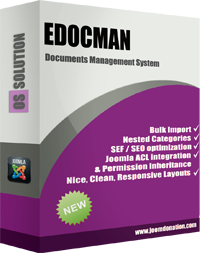 EDocman is the leading document and files download manager extension for Joomla. Building based on Joomla Access Control Level System (ACL), Edocman gives you a very powerful, flexible permission system which you can use to control who can access, download, manage your documents from both front-end and back-end of Joomla site. Especially, Documents Indexing tool can be used to scan PDF, MS Office files as soon as they are uploaded. EDocman has a nice, clean, attractive theme with different layouts to display documents, categories in your system. Check our demo for live examples of EDocman layouts. In Edocman, you can set up a unlimited number of user groups. For each of these groups you can impose create, edit view, download and maintenance permissions, thus controlling who can download what. Edocman has feature to scan of document files (PDF, DOC, DOCx). Search for text inside uploaded files. Indexing happens automatically on our servers on upload. EDocman allows you to organize your documents cross infinite Categories and Sub Categories. You can upload multiple files at once or upload remote files from a URL. The file uploader has a built-in drag and drop area. Allow import all documents from a folder/directory into EDocman just with one click. You are also able to upload files at once or upload remote files from a URL. EDocman allows you to put your files in a hierarchical directories. Edocman offers a simple way to allow users to submit documents from the frontend with integrated notification support. It also allows users, under a controlled environment, to be able to upload, delete or maintain their own private files. Easily create a list of downloadable documents on your site users using the build-in list, column and table layouts. Using the Edocman Group permissions you can easily allow users to moderate certain files and folders right from the front-end area. Storing documents on Dropbox and Amazon storages to reduce your hosting usage. And it's easy to connect Edocman with your Dropbox and Amazon account. Documents can be viewed in the browser itself or with Google Viewer when supported. In addition, Video and Sound files can be played through Media player. Ability to send notification emails to administrator when new documents uploaded, and to users when private document is assigned to them. A lot modules and plugins are included in Edocman package like Categories listing, Top list documents, Search module, Content Edocman link etc. The image gallery is a simple way of displaying an album of specific document. Simply put all your images in a folder and assign them to document, and gallery will be shown in document details page. Intelligent Joomla core SEF router generate friendly urls without having to use any third party SEF extension, You can set meta data (meta keywords, meta description) for each category and document. Basically this allows users, under a controlled environment, to be able to maintain their own private documents. Certain limits can be imposed of course like the number of files or total size. Limit download supported too. EDOCMAN provides the functionality to import data from DOCman extension. Support both Twitter Bootstrap 2 & 3 & 4. Third party storages supported like Dropbox, Amazon S3 .. Fix issue on download/upload documents when third party storage plugins (Dropbox, Gdrive, Amazon S3) are enabled but no parameters entered. Update new Edocman version from Back-end of your site directly. 1. Documents Drag & Drop Ordering. This layout list documents in table view. This layout list documents in columns layout. This is document details layout. This layout list documents in Bookmark list. This layout is used to show Document Upload form. You need to login with account demo/demo if you want to access to this page. This layout list documents of current logged user. You need to login with account demo/demo if you want to access to this page. This layout shows content of Joomla article with Edocman category content embeded. Are you interested in this our extension and want to send pre-sales questions? Do you need the technical supports? Would you like to suggest features / require custom works? Or any other reasons that you want to contact us?